Yes, fall is here! Everything began the day when I prepared fantastic Pumpkin Pie Cupcakes. Of course, there was much more of the pumpkin than I needed for the cupcakes. I was left with the question what to do with these leftovers of pumpkins which were spreading a beautiful aroma all through the kitchen? 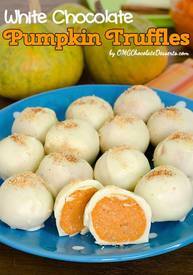 Well, of course, pumpkin truffles! An ideal solution when you don’t know what to do with leftovers of a great desert. And as soon as this great idea came to my mind, the ingredients sorted themselves out: grounded Speculoos cookies, white chocolate, and cinnamon, and as a contrast to the beautiful orange color of the pumpkin, I couldn't think of anything other than melted white chocolate. And so, in a very short time, beautiful little pumpkin balls were cooling before the last step: being dipped into tempered white chocolate.